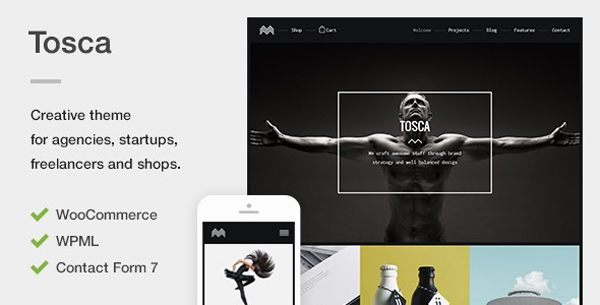 Tosca is an elegant responsive WordPress theme designed for agencies, startups, freelancers or e-commerce shops.The theme is equipped with an exquisite parallax animation on the heading sections, which can be configured on images, videos or sliders and offers a unique, interesting effect to impress your audience. It offers a powerful modular page template, which comes with a beautiful custom module builder that allows you to create your own layouts in seconds. Compose with any background color, text, images, sliders, videos, maps, audio tracks and project galleries with ease and no coding knowledge required. You’ll be able to use the Shortcode Generator that will get you started right away. You’ll be able to use alerts, boxes, tabs, accordions, sliders, pricing tables, call-to-actions, grid layouts or responsive video containers very easily.